The Nightingale family live on a barge on the canal near London Zoo, and Mum is a vet. 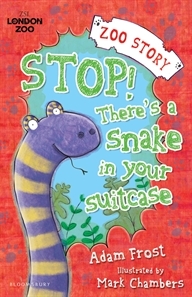 When Tom and Sophie find a bag of snakes dumped at the gates of the zoo, a great and exciting adventure begins. Soon they are finding out about the trade in illegal animals and learning how to care for these wonderful creatures. The snakes are carefully housed in the zoo and, just as they are about to be introduced to the many visitors to the reptile house, a desperate race begins to collect some precious antivenin.The first book in a new series of pacy adventure stories with two courageous children and lots and lots of fascinating animal facts. Animal books are most definitely the big thing right now. i have read more animal stories this year than I have in years. This book has been published in conjunction with the ZSL London Zoo (Zoological Society of London), and that is the setting for this reptilian tale. To be honest, for me, there is very little actual story in this book. The spotting of the smuggler, chasing him, and catching the snakes all takes place in the first 38 pages (the book is 129 pages). So if the action takes place in the first 30+ pages, what happens next? The real appeal of this book is that we, as a reader, get to see the behind the scenes action of the zoo. Because Tom and Sophie's parents both work at the Zoo, they manage to get a 'back stage' pass to the reptile house. They go there after school, and get to spend their weekends seeing things that other zoo goers never get to see. In this story we see that there are actually many more snakes at the zoo, than are actually on display, we get to see snake surgery, learn how to x-ray a snake and also that a snakes organs move around their bodies. The book is so chock full of snake facts, it could almost be considered non fiction, and that is why animal lovers will devour it. Click here to see more about the Regent's Canal.